A textile-based jewellery workshop guiding you to learn how to hand coil cotton strands to create colourful and tactile bracelets. Learn how participating in craft activities encourages focus and concentration to help lower stress levels. This workshop will equip you with instructions to take up a regular practice at home that promotes general well-being through enjoyment of working with your hands with a variety of readily available materials. The techniques learnt on this workshop will aid in increasing fine motor skills and both left and right hand co-ordination. This workshop is relaxed and informal and starts with a simple breathing exercise, and then onto practical demonstrations, discussions and individual tasks with one to one support. All materials will be provided. This talk is part of a regular programme of adult-relevant topics for grown-ups and their babies. I’ll be discussing how we might engage with textiles and our relationship with clothing to help reduce textile waste. Starting with some surprising facts about the world of contemporary fashion and core reasons for its’ dominant culture of consumption. How might our individual and collective actions contribute towards a more sustainable system? MENTAL WEALTH FESTIVAL 2018 - I will be running a workshop for this year's Mental Wealth Festival – a two day festival of talks, debates and workshops on how we can all contribute to people's mental wellbeing. This year’s festival spans two days, Monday 10th September coinciding with World Suicide Prevention Day and Tuesday 11th September. Day 2 takes place at the National Gallery and the focus will be on mental health at home and within communities. There will be an emphasis on connecting the Gallery’s spaces and collection with events that inspire a sense of purpose and positive social empathy. Enjoy the benefits of hand-stitching and its self-induced state of sustained focus whilst taking inspiration from paintings displayed in room 41. You will select colour palettes and textures used by early 20th century painters Paul Cezanne, Henri Matisse and Andre Derain to create your own hand-embroidered brooches. Lovely photography by Philip Hardman Photography. Feel inspired by the colours, textures and motifs from the quintessential wardrobe of Frida Kahlo this summer to coincide with a major exhibition at the Victoria & Albert Museum - ‘Frida Kahlo: Making Her Self Up’. Explore this extraordinary exhibition with a group of like-minded individuals and take your fresh inspiration directly into an intensive workshop. You will learn how to construct different elements of textiles to create your own statement necklace, paying homage to this inspirational artist. Please note the course fee includes the cost of exhibition entry to Victoria & Albert Museum on Monday 13th August at 2pm, where we will meet to view the exhibition as a group. For further details of this exciting new workshop and bookings please visit the course page on the City Lit website. A workshop exploring various experimental fabric wrapping and stitching techniques to create organic, colourful coiled forms and surface textures. You will learn techniques in how to re-use your fabric remnants and leftover threads to create a range of samples to inspire your personal projects and jewellery-making. Please feel free to bring your own sewing kit and selection of fabric remnants and threads. I'll be presenting a talk on a variety of my projects from developing my textile jewellery practice from exhibitions and arts residencies to socially-engaged workshops. The techniques learnt on this workshop will aid in increasing fine motor skills and both left and right hand co-ordination. This workshop is relaxed and informal and starts with a simple breath, body and sound awareness exercise, and then onto practical demonstrations, discussions and individual tasks with one to one support. All materials will be provided. Learn how participating in craft activities can encourage focus and concentration. You will learn how to make your own textile bracelets to take away with you. 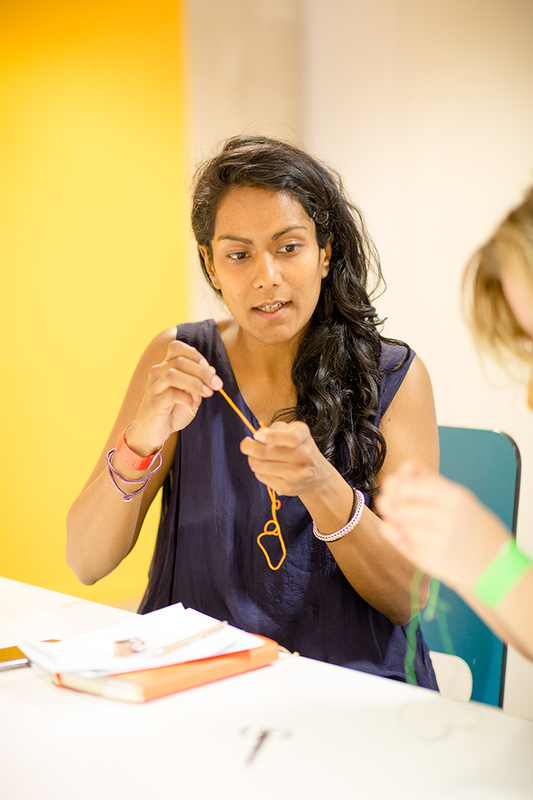 Working with two artist tutors in textiles - Caroline Bartlett and jewellery - Tanvi Kant, learn how to create colourful, tactile jewellery and embellishments. You'll produce hand-painted and transfer printed textiles before manipulating them with plaiting, knotting, hand-stitch and elemental cord-making techniques. Learn how to use colour as a design tool in a number of different mediums and processes. Taught by experts in their area - Tanvi Kant, Kathie Murphy, Lindsey Mann and Natasha Lisa - you will make samples in textiles, resin, aluminium and acrylic. Jewellery has long been an adventurous mode of expression in colour as diverse as the materials fashioned to create it. During this intensive series of practical workshops you will have the opportunity to learn techniques that inspire an experimental approach to colour to develop material samples. Learning from four different tutors you will create a portfolio of mixed-media samples with a diverse range of materials. The course will give you a foundation from which ideas can be generated to feed into your own jewellery making practice. Perfect for jewellers with basic jewellery making skills wanting to extend their material knowledge or challenge their current practice with injecting new ideas and starting points. Join us for a textile-based workshop for 6-11 year olds with a parent on a jetty along the Thames river! I will be teaming up with Jewellery & Metalwork designer Alice McLean to run an inspiring hands-on workshop in learning elemental rope-making techniques to create sculptural plant-like forms. These long tendril-like vines can then be coiled and stitched to make vessels or create freestanding plant-like forms using wire. The final outcomes can either be made individually or collaboratively in parent/child pairs. Makerversity’s residency at Farmopolis sees the jetty transformed into a mini university for kids aged 6-11 hosting an array of hands-on design and making workshops during Autumn Half Term (24th-28th October). Makerversity creates environments for learning and making to inspire the next generation of creative and practical minds. Anyone who is in the business of making, or would like to be, is invited to be part of the community. From designers to hackers, engineers to technologists, coders to urban farmers, makers to inventors; Makerversity provides space, people and support to develop businesses and creative practice. Learn how participating in craft activities can encourage focus and concentration. You will learn how to make your own plaited textile and beaded bracelet to take away with you. 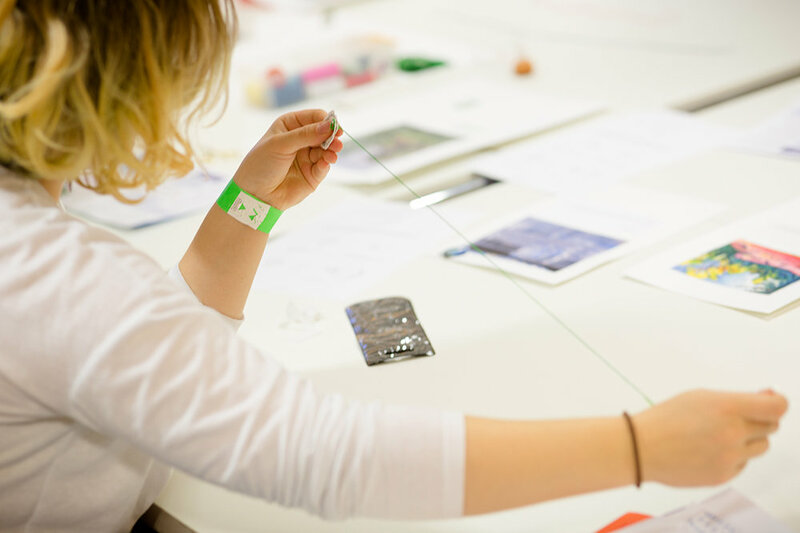 Working with two tutors in textiles and jewellery, learn how to create colourful, tactile jewellery and embellishments. You'll produce hand-painted and transfer printed textiles before manipulating them with plaiting, knotting, hand-stitch and elemental cord-making techniques. Learn how to use colour as a design tool in a number of different mediums and processes. Taught by experts in their area - Tanvi Kant, Kathie Murphy, Lindsey Mann and Tania Clarke Hall - you will make samples in leather, aluminium, textiles, plastics and resin. Learn a variety of hand worked textile techniques such as binding, stitching, plaiting and knotting and explore experimental approaches. Ideal for beginners and makers wishing to work with new materials. Join me at my studio on Saturday 14th November for an afternoon workshop to create your own hand-braided and embellished jewellery. You will learn how to make a bracelet with hand plaiting and stitch combining various textile cords, fabrics and beading. Booking information below!